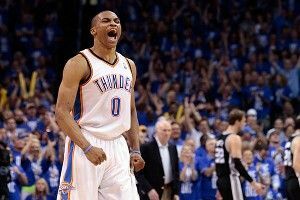 » NBA Finals Preview: Can the Thunder Beat the Heat? The Oklahoma City Thunder’s pick-and-roll play is integral to their offense, which you might remember from my Western Conference finals preview. Of the Thunder’s 1,304 half-court possessions in the playoffs, 426 were pick-and-rolls, according to Synergy Sports. When you consider their roster, these statistics make sense: They are a young team with many ball handlers and they don’t need to run intricate sets. We can be sure the Thunder will keep going to it, and thus the Miami Heat will continue to live and die by their defense. The Heat tend to trap pick-and-roll ball handlers very hard — until they pick up their dribble or make a pass. During two regular-season games, both of which were played late this season, the Heat stifled Russell Westbrook and James Harden. We can use those games to analyze what we’ll see in this series. We pick up this possession with Russell Westbrook coming off a ball screen set by Nick Collison on the wing. Udonis Haslem had been covering Collison, but he jumps out to trap Westbrook from one side, while LeBron James (Westbrook’s defender) comes over the screen to trap on the other. 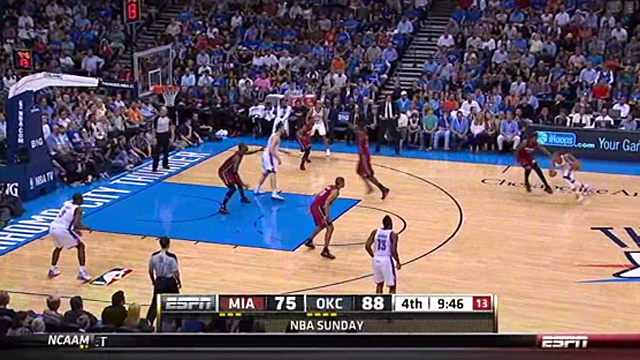 The trap prevents Westbrook from using his explosive speed to get to the basket. Instead, Westbrook has to dribble backward, away from the rim. Miami releases the traps when one of the following happens: the ball handler passes, picks up his dribble, or dribbles backward. 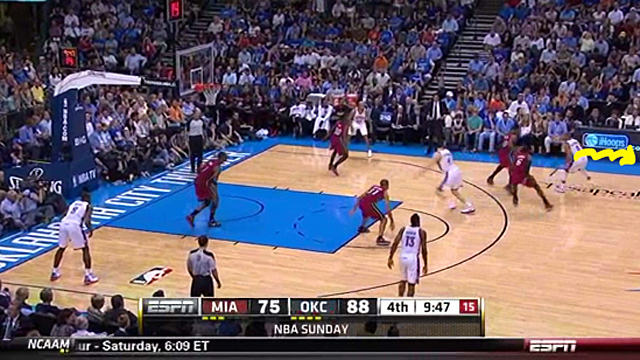 Since Westbrook dribbles backward, James leaves to cover Collison while Haslem stays on Westbrook. At first glance this looks like a mismatch, but it isn’t. What you don’t see here? Westbrook dribbling off the screen with his signature speed. Miami’s traps slow him down and make him very uncomfortable, forcing him to try things beyond his usual stable of moves, often resulting in turnovers. Many analysts and fans will suggest that Harden should be the ball handler in these situations instead, but he struggles with these traps, too. Harden can knock down a pull-up jumper off a screen, but it’s not his preference. He would rather attack the rim for either an easy bucket or a kick-out to an open teammate, but the Miami traps negate those options. Harden does have a savvy game where he uses hesitations to get free, but these traps force him to make quick decisions. 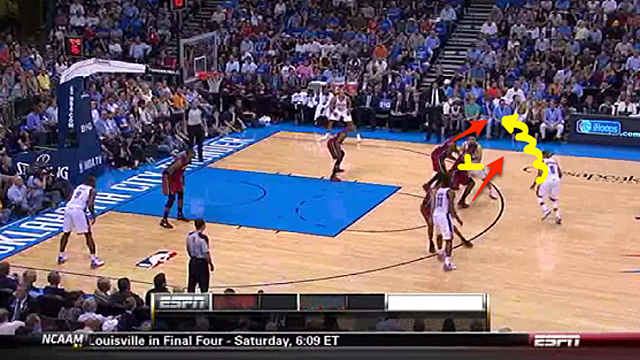 If the Thunder hope to counter these hard traps, they need to change the pick-and-roll setup. In these plays above, the pick-and-rolls and subsequent traps occur after a lot of standing around. 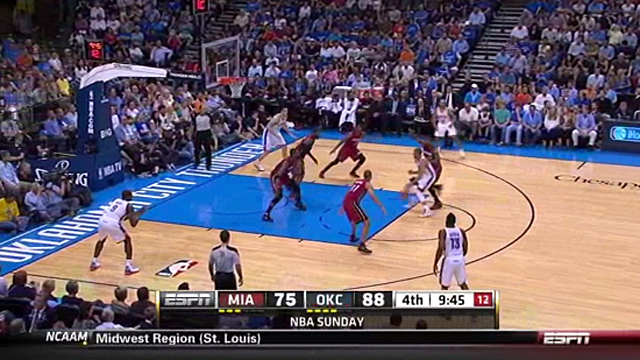 The Thunder need to disrupt the Miami defense by forcing them to move more. When OKC did this, Westbrook’s job was a lot easier. Here we see two clips of Westbrook coming off screens to knock down pull-up jumpers. Notice that Miami is not trapping because the bigs who usually do it are occupied with their individual defensive assignments. In the first clip, the Thunder are running their version of the San Antonio Spurs’ “weak” set. Westbrook gives up the basketball, shallow cuts, and then gets the ball back on the opposite side. As this is happening, Kevin Durant sets a ball screen for Serge Ibaka, who comes off it to in turn set a ball screen for Westbrook. Chris Bosh, guarding Ibaka, is forced to work through this screen, so he is unavailable to trap Westbrook, who can rise up and knock down the jumper. In the second clip, the Thunder are running a “loop” action with Harden cutting off of the ball and Westbrook coming off a back screen from Collison. Westbrook is immediately able to take his jumper. How is this possible? Watch Haslem closely. He has to step backward to make sure Harden doesn’t get open, meaning he can’t trap Westbrook. With Harden as the ball handler, the theory remains the same, though he’s better with early screens set above the 3-point line. The high screens give Harden the space to maximize his herky-jerky game. The Thunder set “drag” screens in transition or during the secondary break to let Harden come off a ball screen before the defense gets set, making it difficult for Miami to trap. if the Thunder are to win, they need to adjust their game beyond what we saw them do during the regular season. They need to add a pick-and-pop game. This is something that I have talked about in the past in regard to Miami. Because they trap so hard, they can be exploited by a good pick-and-pop player, which is what happened in their series with Indiana. Oklahoma City doesn’t have a David West, but they do have Serge Ibaka. He may be struggling this postseason (shooting just 33.3 percent in pick-and-pops), but you can’t ignore his regular-season success (shooting 54.5 percent). Yet the Thunder hardly use their roll men in pick-and-rolls. Out of the 64 pick-and-rolls that the Thunder ran against Miami this season, they hit the roll man just seven times (10.9 percent). During the playoffs, they have done it just 17.1 percent of the time. What’s worse is they don’t seem to be using Ibaka as a roll man. In fact, in the two games against Miami, Ibaka got no touches in the pick-and-roll. If I were an Oklahoma City Thunder fan, I’d be worried. They just don’t do enough to counter Miami’s traps, and I don’t see the Thunder outscoring Miami — especially if the Thunder refuse to run pick-and-pops with Ibaka. I am picking the Miami Heat to win in seven games.